6 Purple Fabric Violets with Leaves ~ Austria ~ 1"
Bundle of 6 purple fabric violets with leaves. Blossoms measure approx. 1" across with green wired stems measuring 4" long. Leaves measure 1-1/8" long. 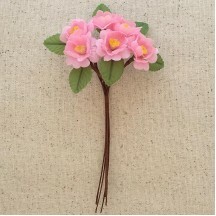 Bundle can be separated into 6 stems with one flower and one leaf per stem. Imported from Austria. These blooms are exquisitely made using antique dies and flower crafting techniques. 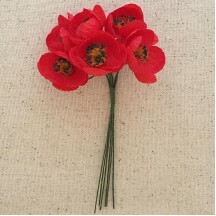 6 Red Fabric Millinery Poppies ~ Austria ~ 1"
Bundle of 6 red fabric poppies. Blossoms measure approx. 1" across with green wired stems measuring 4" long. Imported from Austria. These blooms are exquisitely made using antique dies and flower crafting techniques. 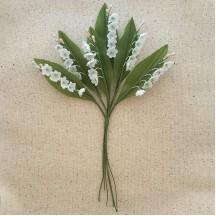 Bundle of 6 white fabric lily of the valley with leaves. Blossoms measure approx. 3/8" across with green wired stems measuring 4-1/2" long. Leaves measure 3" long. 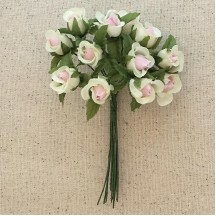 Bundle can be separated into 6 stems with five flowers and one leaf per stem. Bundle overall measures 8-1/2" long. Imported from Austria. These blooms are exquisitely made using antique dies and flower crafting techniques. 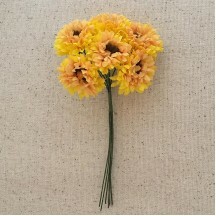 6 Golden Yellow Fabric Ruffled Daisy Blossoms ~ Austria ~ 1-1/8"
Bundle of 6 two-tone golden yellow fabric ruffled daisies. Blossoms measure approx. 1-1/8" across with green wired stems measuring 4-1/2" long. Imported from Austria. These blooms are exquisitely made using antique dies and flower crafting techniques. 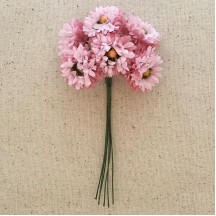 6 Pink Fabric Ruffled Daisy Blossoms ~ Austria ~ 1-1/8"
Bundle of 6 two-tone pink fabric ruffled daisies. Blossoms measure approx. 1-1/8" across with green wired stems measuring 4-1/2" long. Imported from Austria. 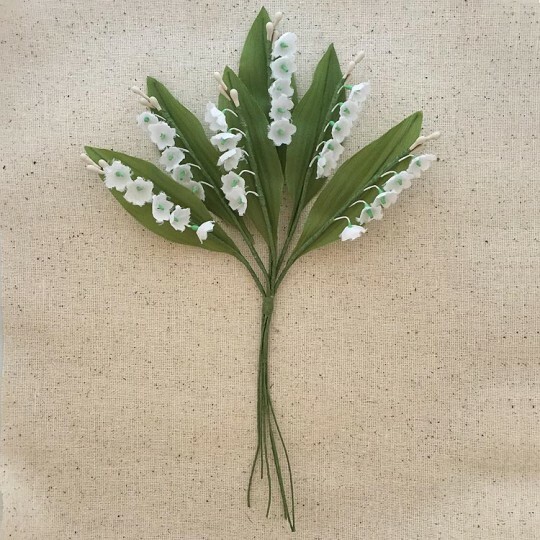 These blooms are exquisitely made using antique dies and flower crafting techniques. 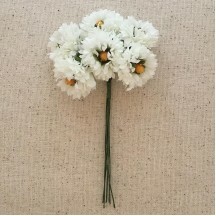 6 White Fabric Ruffled Daisy Blossoms ~ Austria ~ 1-1/8"
Bundle of 6 white fabric ruffled daisies. Blossoms measure approx. 1-1/8" across with green wired stems measuring 4-1/2" long. Imported from Austria. 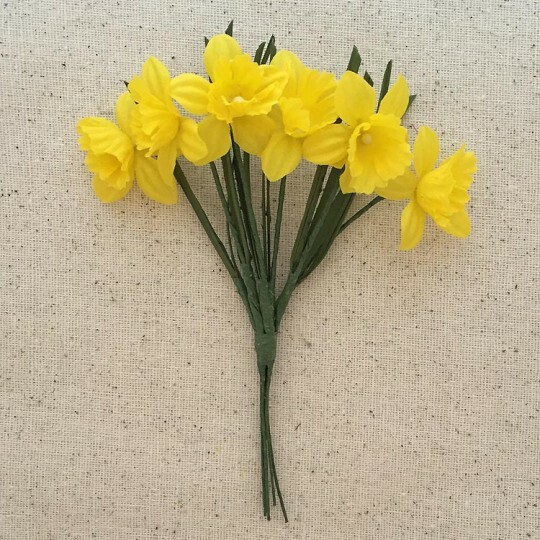 These blooms are exquisitely made using antique dies and flower crafting techniques. Bundle of petite blue fabric forget me nots with leaves. 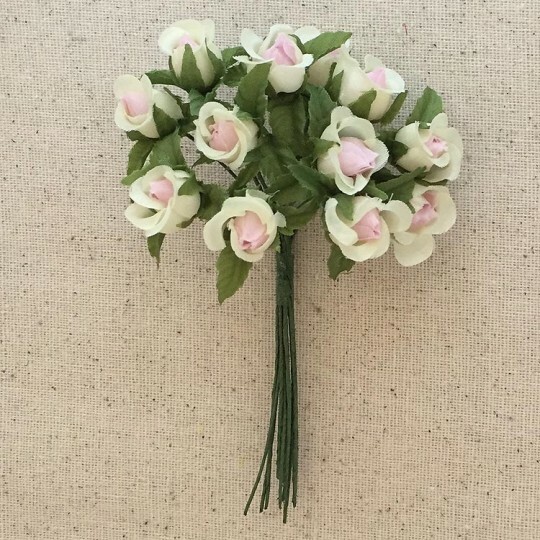 There are 6 stems per bundle, with five tiny flowers per stem. Each stem is approximately 4-1/2" long. This listing is for 1 bundle. Each flower approximately 3/8" across. Imported from Austria. These blooms are exquisitely made using antique dies and flower crafting techniques. 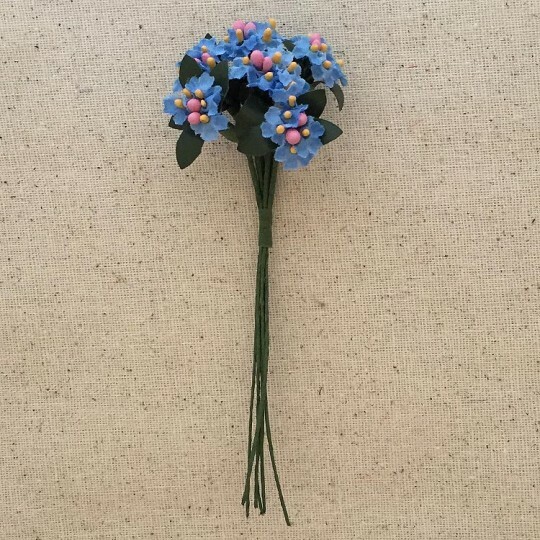 Bundle of petite pink fabric forget me nots with leaves. There are 6 stems per bundle, with five tiny flowers per stem. Each stem is approximately 4-1/2" long. This listing is for 1 bundle. Each flower approximately 3/8" across. Imported from Austria. These blooms are exquisitely made using antique dies and flower crafting techniques. 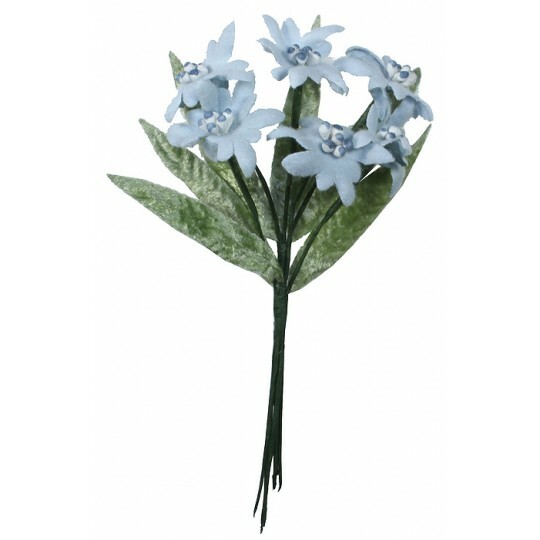 Bundle of petite white fabric forget me nots with leaves. 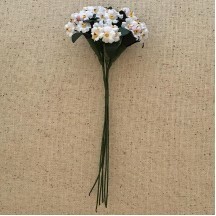 There are 6 stems per bundle, with five tiny flowers per stem. Each stem is approximately 4-1/2" long. This listing is for 1 bundle. Each flower approximately 3/8" across. Imported from Austria. 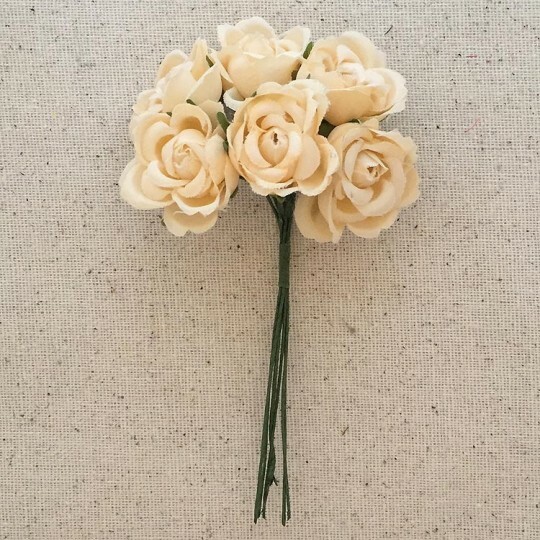 These blooms are exquisitely made using antique dies and flower crafting techniques. 6 Dark Pink Fabric Millinery Cherry Blossoms with Leaves ~ Austria ~ 3/4"
Bundle of 6 dark pink fabric cherry blossoms with leaves. Blossoms measure approx. 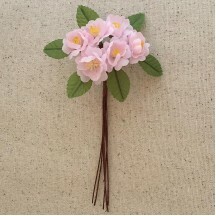 3/4" across, leaves measure 1" long and brown wired stems measuring 4-1/2" long. Imported from Austria. These blooms are exquisitely made using antique dies and flower crafting techniques. 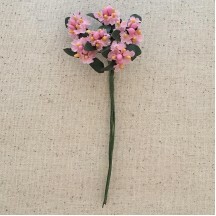 6 Light Pink Fabric Millinery Cherry Blossoms with Leaves ~ Austria ~ 3/4"
Bundle of 6 light pink fabric cherry blossoms. Blossoms measure approx. 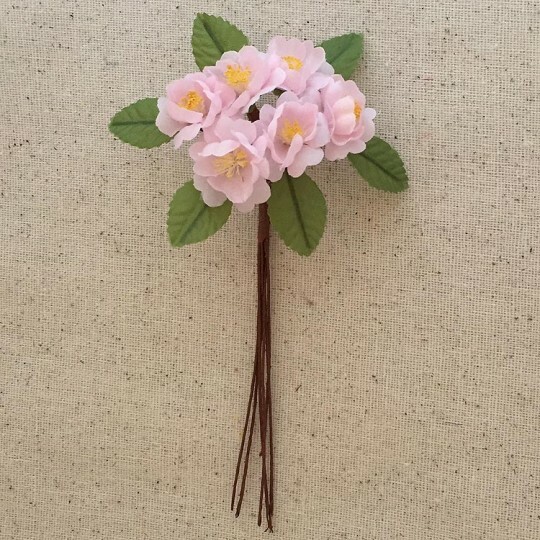 3/4" across, leaves measure 1" long and brown wired stems measuring 4-1/2" long. Imported from Austria. 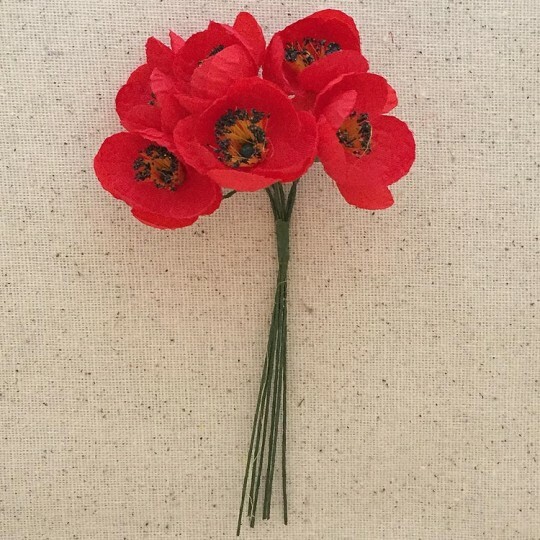 These blooms are exquisitely made using antique dies and flower crafting techniques. 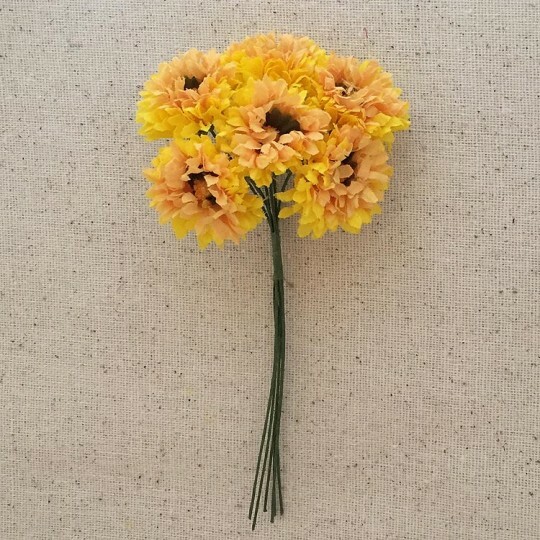 6 Pale Yellow Fabric Ruffled Zinnias with Leaves ~ Austria ~ 1"
Bundle of 6 pale yellow fabric ruffled zinnias with leaves. Blossoms measure approx. 3/4" across with green wired stems measuring 4-1/2" long. Leaves measure 1-1/4" long. Bundle can be separated into 6 stems with one flower and one leaf per stem. Imported from Austria. These blooms are exquisitely made using antique dies and flower crafting techniques. 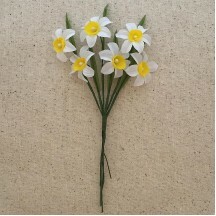 6 White and Yellow Fabric Narcissus Blossoms ~ Austria ~ 1"
Bundle of 6 white and yellow fabric narcissus blossoms with leaves. Blossoms measure approx. 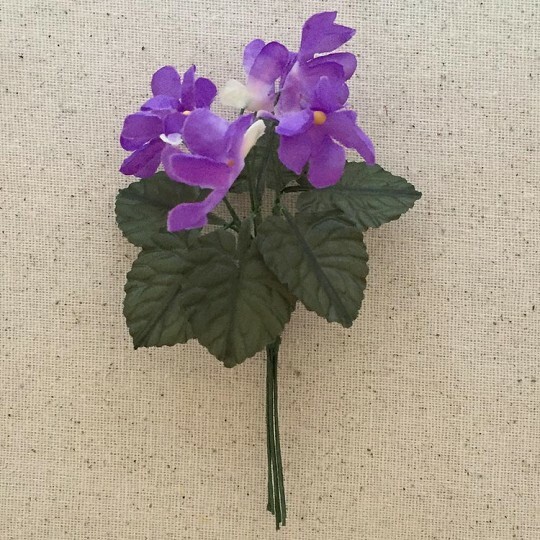 1" across, leaves measure 2-1/4" long with green wired stems measuring 4" long. Imported from Austria. These blooms are exquisitely made using antique dies and flower crafting techniques. Bundle of 6 yellow fabric daffodil blossom. Blossoms measure approx. 1-1/2" across with green wired stems measuring 4" long. Imported from Austria. These blooms are exquisitely made using antique dies and flower crafting techniques. 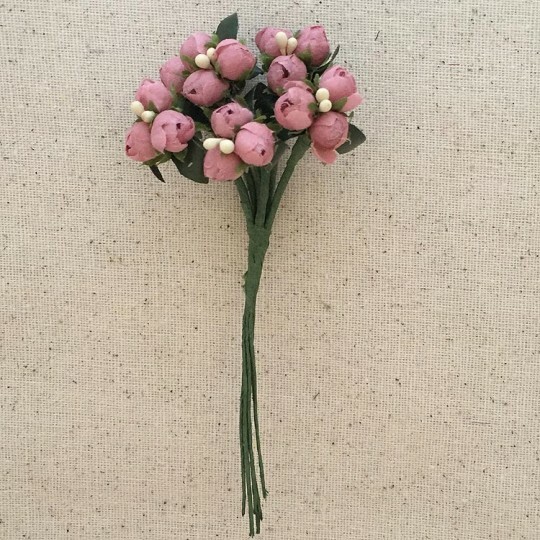 Bundle of Dusty Pink Fabric Flower Buds ~ Austria ~ 1/4"
Bundle of dusty pink fabric flower buds with leaves. There are 6 stems - each stem has 3 buds, for a total of 18 buds. Each cluster of 3 buds is approximately 1" across; each individual bud is approx. 1/4" across. 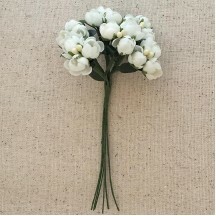 Paper wrapped wire stems measure approx. 4" long. Imported from Austria. These blooms are exquisitely made using antique dies and flower crafting techniques. 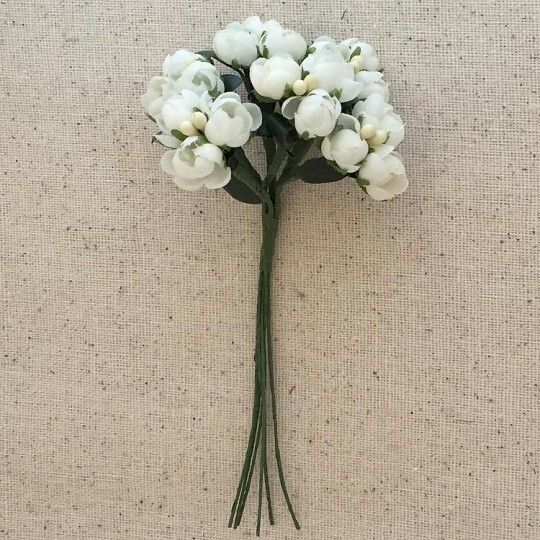 Bundle of White Fabric Flower Buds ~ Austria ~ 3/8"
Bundle of white fabric flower buds with leaves. There are 6 stems - each stem has 3 buds, for a total of 18 buds. Each cluster of 3 buds is approximately 1" across; each individual bud is approx. 3/8" across. 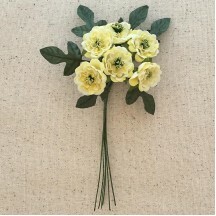 Paper wrapped wire stems measure approx. 4-1/2" long. Imported from Austria. 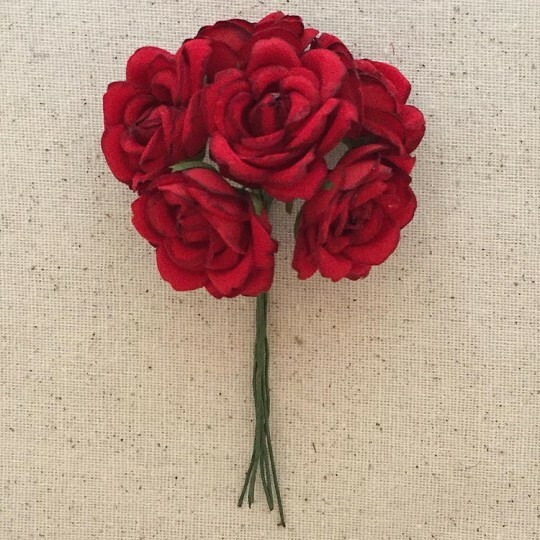 These blooms are exquisitely made using antique dies and flower crafting techniques. Bundle of Yellow Fabric Flower Buds ~ Austria ~ 3/8"
Bundle of yellow fabric flower buds with leaves. There are 6 stems - each stem has 3 buds, for a total of 18 buds. Each cluster of 3 buds is approximately 1" across; each individual bud is approx. 3/8" across. Paper wrapped wire stems measure approx. 4" long. Imported from Austria. 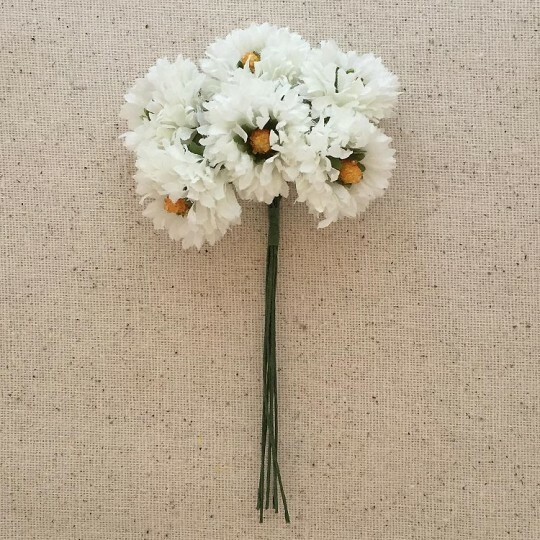 These blooms are exquisitely made using antique dies and flower crafting techniques. 6 Butter Cream Fabric Millinery Roses ~ Austria ~ 1"
Bundle of 6 butter cream fabric roses. Blossoms measure approx. 1" across with green wired stems measuring 4" long. Imported from Austria. 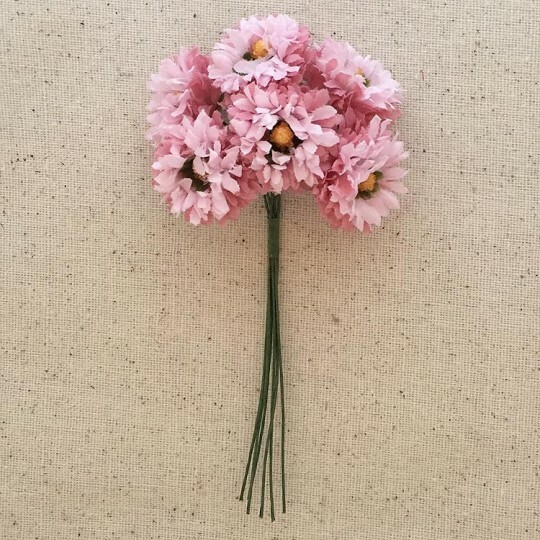 These blooms are exquisitely made using antique dies and flower crafting techniques. 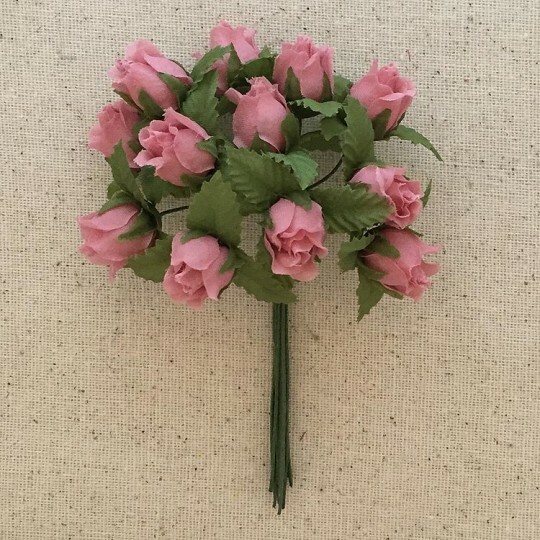 6 Dusty Rose Fabric Millinery Roses ~ Austria ~ 1"
Bundle of 6 dusty rose fabric roses. Blossoms measure approx. 1" across with green wired stems measuring 4" long. Imported from Austria. These blooms are exquisitely made using antique dies and flower crafting techniques. 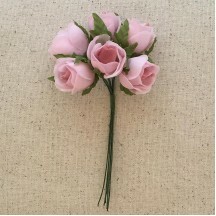 6 Pink and Dusty Rose Fabric Millinery Roses ~ Austria ~ 1"
Bundle of 6 two-tone pink and dusty rose fabric roses. Blossoms measure approx. 1" across with green wired stems measuring 4" long. Imported from Austria. These blooms are exquisitely made using antique dies and flower crafting techniques. 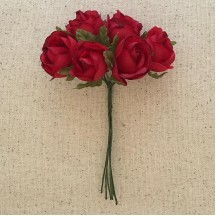 6 Red Fabric Millinery Roses ~ Austria ~ 1"
Bundle of 6 red fabric roses. Blossoms measure approx. 1" across with green wired stems measuring 4" long. Imported from Austria. These blooms are exquisitely made using antique dies and flower crafting techniques. 12 Dusty Rose Fabric Millinery Rose Buds ~ Austria ~ 1/2"
Bundle of 12 dusty rose fabric rose buds. Blossoms measure approx. 1/2" across with green wired stems measuring 4" long. Imported from Austria. These blooms are exquisitely made using antique dies and flower crafting techniques. 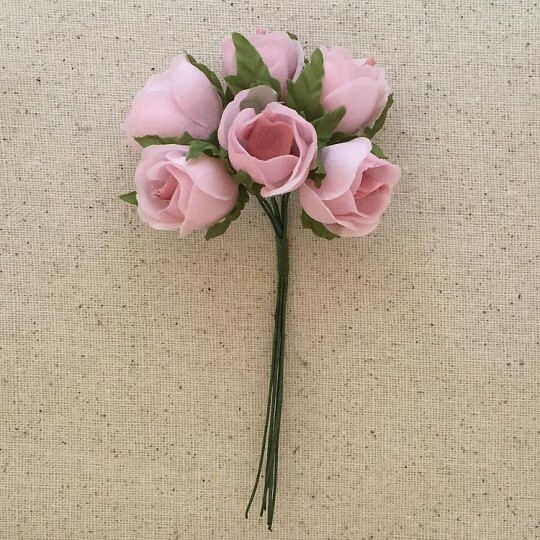 12 Pink and Ivory Fabric Millinery Rose Buds ~ Austria ~ 1/2"
Bundle of 12 pink and ivory fabric rose buds. Blossoms measure approx. 1/2" across with green wired stems measuring 4" long. Imported from Austria. These blooms are exquisitely made using antique dies and flower crafting techniques. 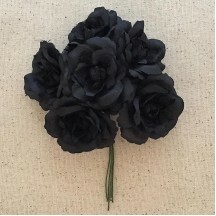 6 Black Fabric Millinery Roses ~ Austria ~ 1-3/4"
Bundle of 6 black fabric roses. Blossoms measure approx. 1-3/4" across with green wired stems measuring 4" long. Imported from Austria. These blooms are exquisitely made using antique dies and flower crafting techniques. 6 Deep Red Fabric Millinery Roses ~ Austria ~ 1-1/4"
Bundle of 6 deep red fabric roses. Blossoms measure approx. 1-1/4" across with green wired stems measuring 4" long. Imported from Austria. These blooms are exquisitely made using antique dies and flower crafting techniques. 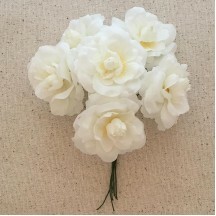 6 White Fabric Millinery Roses ~ Austria ~ 1-3/4"
Bundle of 6 white fabric roses with subtle yellow center accents. Blossoms measure approx. 1-3/4" across with green wired stems measuring 4" long. Imported from Austria. 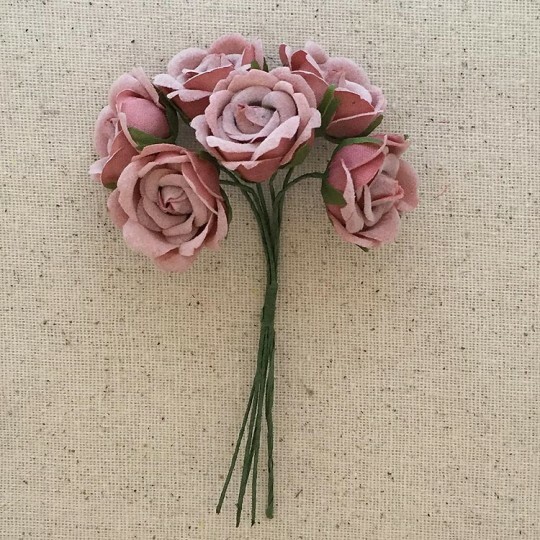 These blooms are exquisitely made using antique dies and flower crafting techniques. Cluster of 6 handmade fabric pansies in lavender with three leaves. 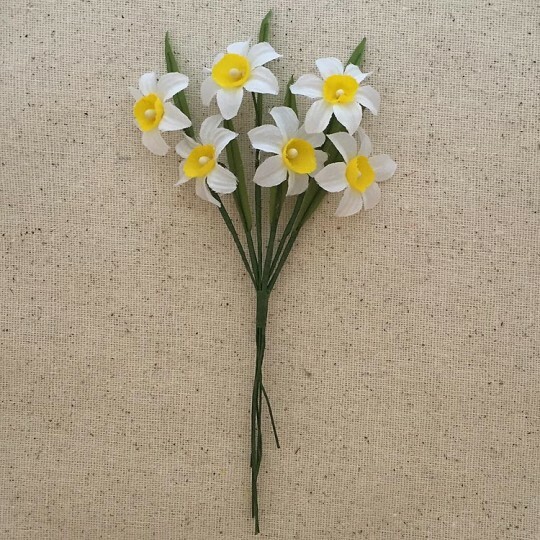 Flowers measure about 1.25"; overall bunch measures 5.5". Imported. 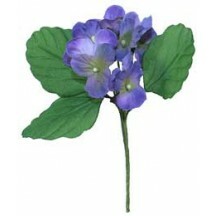 Cluster of 6 handmade fabric pansies in white with purple accents with three leaves. 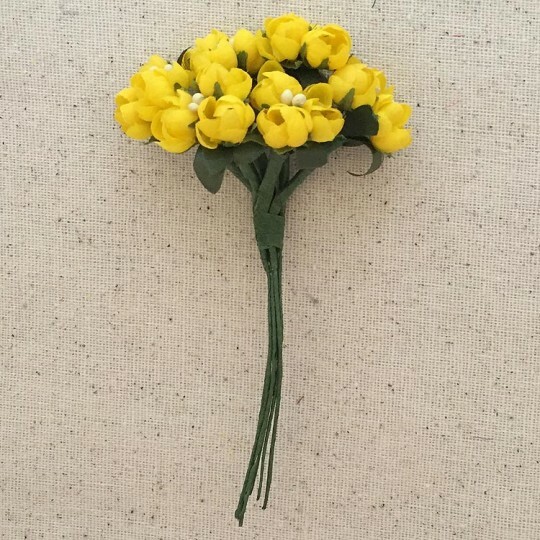 Flowers measure about 1.25"; overall bunch measures 5.5". Imported. Cluster of 6 handmade fabric edelweiss blossoms in pale blue felt with 6 pale green velvet leaves. 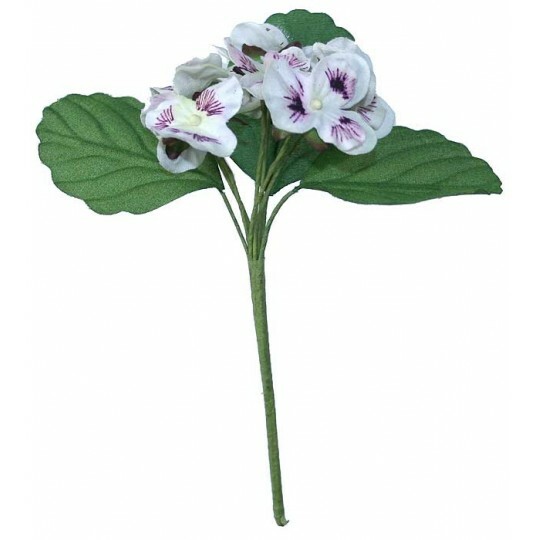 Flowers measure about 1-3/8" across and leaves are 2-5/8" longl; overall bunch measures 6-1/2". Imported.